Component of the Parameter Set Antidepressants 2/Psychostimulants, available separately. 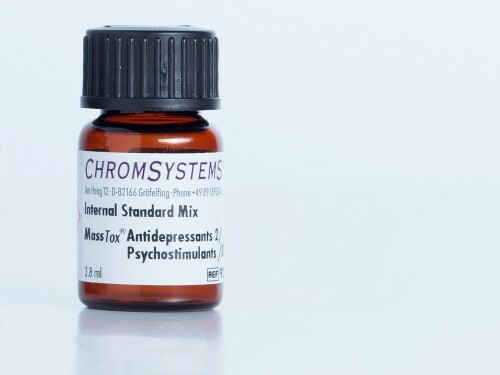 Internal Standard Set for Antidepressants 2/Psychostimulants in serum/plasma, consisting of: Internal Standard Mix 4 x 1 ml (lyoph. ), Reconstitution Buffer 5 ml. Thaw one vial of lyophilised Internal Standard. Remove the seal and rubber stopper from the vial. Reconstitute the lyophilised internal standard with exactly 1 ml of reconstitution buffer. Close the vial with the rubber stopper and let it stand for about 5 minutes at room temperature, gently shake the vial repeatedly until the content of the bottle is homogeneous. Avoid direct sunlight. Information: The reconstitution buffer contains stabilising additives. To ensure stability of the internal standard, the reconstitution buffer has to be used.